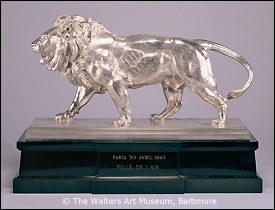 Antoine-Louis Barye, Walking Lion; Striding Lion (Racing Trophy), 1865, silver on marble plinth, 19 1/2 x 26 3/4 x 8 3/4 in., The Walters Art Museum, Baltimore. This sculpture, whose detailed surface makes it difficult to protect from tarnish, would be a prime candidate to receive a new, nanometers-thick coating being developed by materials scientists and conservators at the Walters Art Museum and the A. James Clark School of Engineering at the University of Maryland. Image courtesy of the Walters Art Museum. "ALD gives us an exquisite level of control, literally at the atomic level," says Department of Materials Science and Engineering (MSE) Professor Ray Phaneuf, one of the investigators working on the project. "It's an effective, low-cost strategy to reduce corrosion that preserves artifact appearance and composition while complying with the rigorous standards of art conservation practice." In April 2011 the National Science Foundation's Science Nation web site, which highlights scientific discoveries for the public, debuted a video segment about the project called "Silver Saver," narrated by former CNN chief technology and environment correspondent Miles O'Brien.